A beer-making (and drinking) tradition that spans more than 175 years has earned Milwaukee the nickname Brew City. Early beer barons began brewing here before Milwaukee became a city and before Wisconsin earned its statehood, and now are revered in the city’s lore. The Major League Baseball team isn’t called the Brewers for nothing. German immigrants who settled here in the mid-1800s brought with them the know-how to produce high-quality lagers, and ultimately dozens of breweries sprang up to cement the city’s stock in brewing. Some say Milwaukee’s sudsy reputation exploded after the Great Chicago Fire in 1871, when the Illinois city’s thirst could not be quenched and Milwaukee sent water and beer southward. This outward view ultimately resulted in Milwaukee’s beers being distributed far beyond the Windy City. By the turn of the 20th century, Milwaukee became known as the city of beer barons. Names like Pabst, Schlitz, Miller and Blatz were joined by others, and the city thrived. Breweries were required to provide beer breaks during their workers’ shifts. Tied houses, bars “tied” to a particular brewer, sprang up all over town. For a nickel you could buy a beer and a seat at the house’s buffet table. The city’s love affair with beer survived Prohibition and thrived well into the 1970s, when TV’s Laverne and Shirley worked the production line at the fictional Shotz Brewery in Milwaukee, the name an amalgam of the city’s beer barons. But the good times eventually began to dry up, one bottle at a time, as most of the big breweries scaled back, shut down or were sold. One of the biggest shocks came in 1981, when the Schlitz family sold the once-bustling brewery to Stroh Brewery Co. of Detroit. All is not lost, though. For one, Miller still makes upwards of 10 million barrels a year at its Milwaukee production facility. Although it’s based elsewhere, Miller still has 163 years of history behind it in Milwaukee. And in the past few years a new wave of craft brewers has arisen, in some cases eager youngsters who want to make their mark. So what kind of beer town is Milwaukee now? 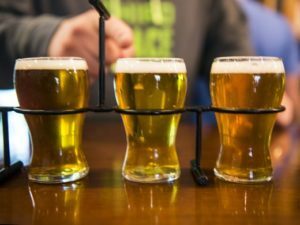 A bit late to the craft beer party, yet a thirsty one, say local brewers. There are more than 30 breweries in the city and surrounding areas, and it’s once again a great place to find a beer. And the city certainly has history on its side. Let’s explore some of the city’s past and several of the current entrepreneurs who are striving to solidify Milwaukee’s reputation as Brew City. Take a virtual beer scene tour in the photo gallery above, and celebrate American craft beer below. Brewery in Milwaukee has become one of the fastest-growing craft breweries in the country, on pace this year to double its 2017 volume of 2,200 barrels thanks to current expansion. 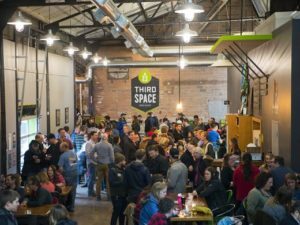 Third Space beer is distributed in 350 bars and restaurants in a seven-county area around the city. 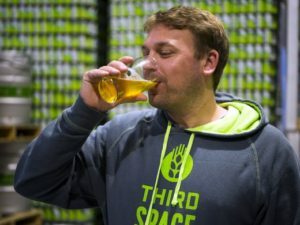 Andy Gehl, co-founder of Third Space Brewery, sips a beer in the brewery’s storage area. Gehl and business partner Kevin Wright met as summer camp counselors, and they established the brewery in 2016. Wright won the JS Ford Award, presented by the London-based International Institute of Brewing and Distilling for top academic performance.